Remember I have blogged about Fizz Friendster's Screening Tickets Giveaway? Step Up 3D and Resident Evil: Afterlife? It was great that Friendster offering their members free screening to get more people join the social website. First of all, I am sorry if you are participating the contest because wanna watch both movie in 3D but in the end didn't manage to. 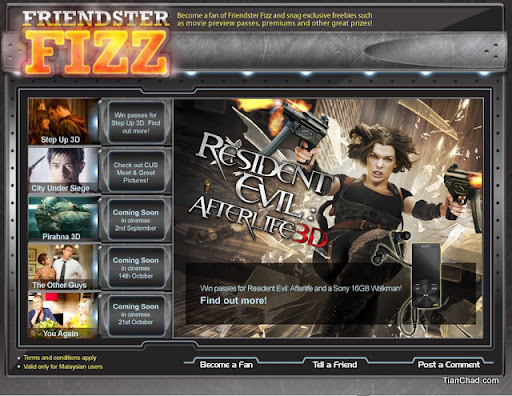 That's why I removed the word "3D" for Resident's Evil Post after I learned the lesson through Fizz Friendster's first screening - Step Up 3D. Sigh...I personally feel that if Friendster wanna attract more people to join the website, especially when they are chasing up so many social website out there. A movie that was recorded using 3D technique should be watched with 3D glasses also right? If not what's the main point sponsoring the movie at first hand? Since you are investing on something nice, why not giving it at the best? well i was invited for the step up as well but given away my invites to my friend and then i know it wasn't in 3d... didnt get the invites for Resident Evil tho but thank God I get the chance to watch the 3D version by Nuffnang! :D It was great! btw nice meeting you the other day during Buka Puasa session with Digi..
Hope Friendster do better next time.